For nine months in a row, Seattle has been leading the nation in home price appreciation with values rising 12.4 percent over the last year, according to new data from Zillow (headquartered in Seattle). 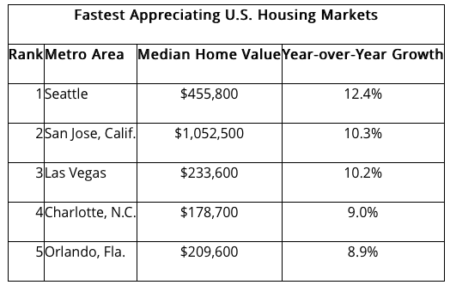 San Jose, California; Las Vegas; Charlotte, North Carolina; and Orlando, Florida; rounded out the top five fastest appreciating markets with values increasing anywhere from 8.9-10.3 percent, but there is one city that is noticeably missing from the list — San Francisco. San Francisco is known for being an overvalued market with sky-high median home prices ($1,236,700) and dilapidated homes that can still garner an $800,000 asking price. But despite those factors, the city by the bay’s home price appreciation has actually slowed down to 6 percent — 0.9 percentage points below the national average. Furthermore, San Francisco’s median home price is projected to only rise 2.3 percent in 2018. There’s no doubt that Amazon has played a part in Seattle’s market and value growth over the years — the online retail giant now owns 19 percent of all prime office space in the city and has employed 40,000 Seattleites, which has driven up wages and decreased the unemployment rate, says The Seattle Times. And even though they’re in the process of finding an additional headquarters, Amazon is still snapping up commercial real estate all over Seattle. According to GeekWire, Amazon is set to buy four more offices located on 300 Pine, Rainier Square, 9th and Thomas and the former Pemco Building in downtown Seattle.